This lovely twenty something Toronto based female fractured her nose at an early age and underwent a septoplasty at the age of twelve without much improvement in breathing. She found her left nasal channel was compromised, she had chronic intermittent bleeding from that side and her breathing was noisy and loud. 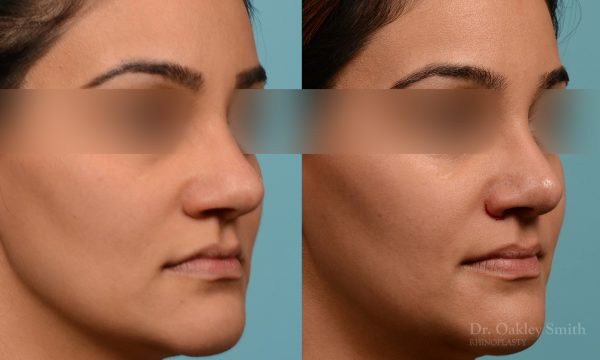 Aesthetically she wanted her crooked nose straightened, the base of her nose narrowed, her tip narrowed and the roundness improved by creating tip defining points. Given the thickness of her skin, the refinement was expected to be limited. Surgery was able to de-project her tip only by one millimeter. This is a mild overall reduction in nasal size. However the thicker the skin, the less de-projection can be expected. 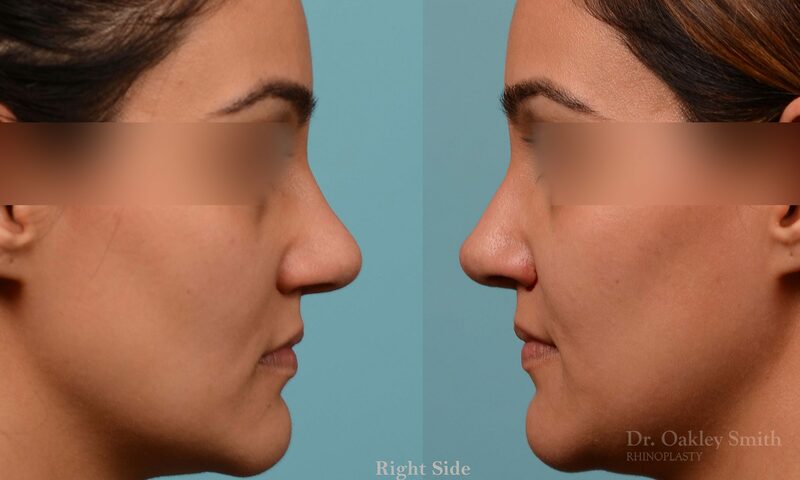 On basal view, the deviated septum can be seen just poking out into her left nostril. The blood at her right alafacial groove is due to cutting tiny skin adhesions along the incision used to narrow her nasal base. Because of the numerous skin glands found in this area, tiny bridging can form during healing and is required to be broken down after surgery. This is one of the reasons the scar here isn’t as clean looking and nearly invisible as it is at the columellar open approach incision. 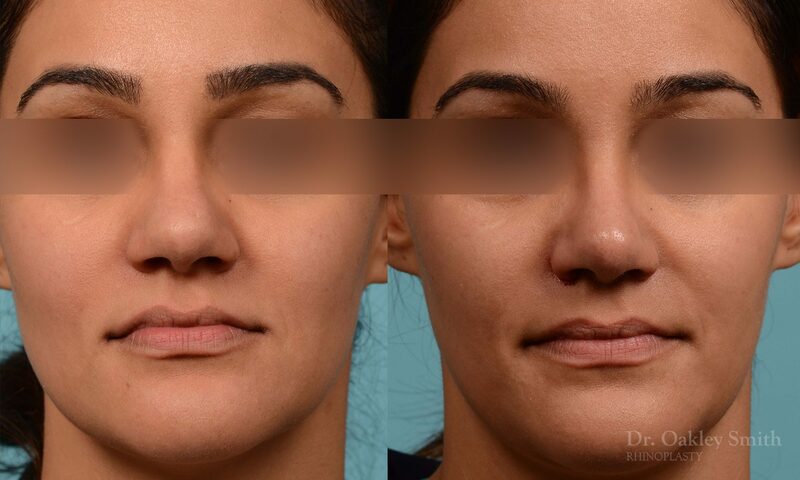 The base of her nose has been narrowed slightly and usually a greater degree is achieved. Her tip has been narrowed, in particular the supratip area. The bent nose, which bothered her, has fortunately been improved. 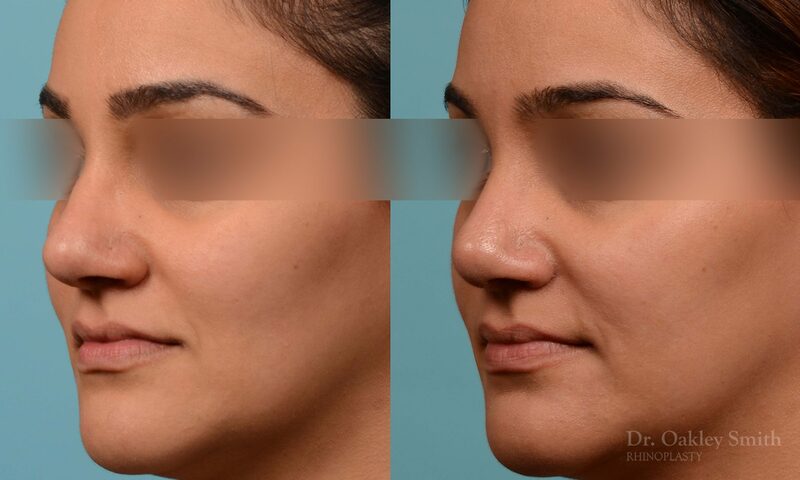 This is a difficult maneuver as many parts of a nose need to be all successfully re-positioned and hence the rate of failure is elevated for most cases at 30%. These before and after rhinoplasty pictures of patients of Dr Oakley Smith appear because of the generosity of his patients. 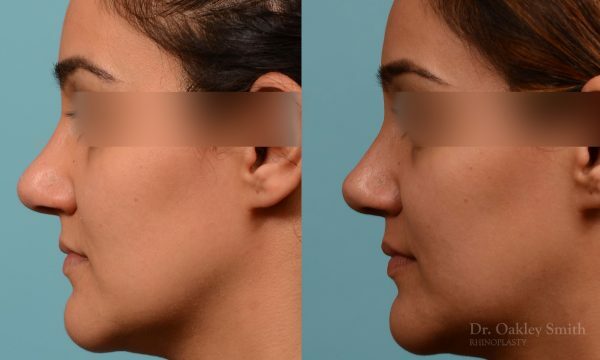 They feel pictures can help others seeking a nose job surgery to better understand rhinoplasty.